"This is a quick and easy meal for those hot summer evenings." Lightly oil grate. Place steak on grill and cook for 3 to 5 minutes per side or until desired doneness is reached. Remove from heat and let sit until cool enough to handle. Slice steak into bite size pieces. In a small bowl, whisk together the olive oil, vinegar, lemon juice, garlic, salt, pepper and Worcestershire sauce. Mix in the cheese. Cover and place dressing in refrigerator. Onto chilled plates arrange the lettuce, tomato, pepper, onion and olives. Top with steak and drizzle with dressing. Serve with crusty grilled French bread. Enjoy! This salad is fantastic! It is my husband's favorite meal. I am not a huge blue cheese fan, but it works for me in this salad. I would recommend this to anyone. 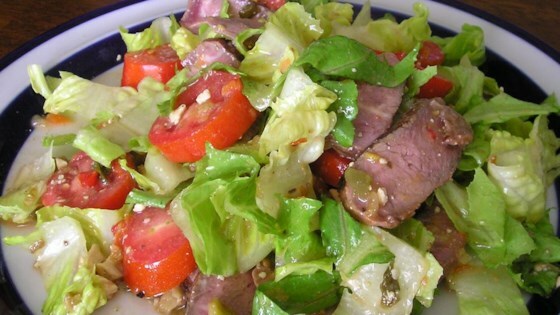 I have to agree with other reviewers...the dressing for this steak salad is incredible! I will be whipping up extra and keeping it on hand for salad, chicken or pork marinade, veggies, etc.